We’d love your help. Let us know what’s wrong with this preview of Dancing with a Dead Horse by Danielle DeVor. When he finds the body of the most popular girl in school, he has a major freak-out session, and then calls 911. But if finding a body wasn’t bad enough, w Sometimes lullabies aren’t soothing; they’re deadly. To ask other readers questions about Dancing with a Dead Horse, please sign up. "Dancing with a Dead Horse" by Danielle DeVor is an excellent and enthralling crime story for young adults. 16 year old Jason tries to get on with his teenage life as good as he can. He is pestered by his mother, a Russian ballet teacher - who I absolutely loved as very colourful and amusing character. Of course, for Jason she is mostly annoying. Jason finds the dead body of a popular girl at school and becomes a suspect (due to some mysterious little horse figure left in his locker). As you can s "Dancing with a Dead Horse" by Danielle DeVor is an excellent and enthralling crime story for young adults. As you can see, there is a lot going on that makes the book a well rounded and interesting book about teenage life. Jason narrates his story himself, which allows for some great observational humour, wit and insight into the perspective of a young person, a perspective that I seriously enjoyed. When the murder turns into one of many things become more involved. I absolutely loved this book for its dialogue and the characters (another favourite of mine was the Russian Mafia uncle). Issues, such as annoying parents and family life from the young perspective are handled with sensitivity and great awareness without distracting from the main crime plot too much. DeVor seems a natural story teller who knows how to engage her audience. Very well done. Jason wasn't exactly excited about going to school today, but nothing could have prepared him for finding the most popular girl dead in the boys restroom. Now everyone is convinced he's responsible. Principal - Jason, I know you killed her because you called 911 instead of getting a school administrator. Principal - Uh-huh, and I'm telling the police. Jason - You just don't like me. Detective - Jason, we know you did it because your principal told us you did. Jason - You're all against me. This was just painful to read. I have learned that I really hate books where characters seem to have a personal vendetta against them for no apparent reason. That is all this book was. From the moment the body was found, and Jason calls 911, everyone assumes he's the murderer, yet they have no basis for this reasoning (at least none that DeVor shared with us). How does this amke any sense? Jason has an alibi for the time of death, yet that is not good enough for the principal or detective. They cannot get past the idea that Jason is the only person who could have killed her. I guess DeVor has never seen ANY episode of Law & Order. Jason Miller narrates this dark YA tale of a serial killer who preys on the junior class of his high school, and seems to want to frame Jason for the murders. And he thought school was bad before the killing spree started. His mother is a former Russian ballet dancer who defected to marry an American mechanic. She teaches ballet, and forces Jason to take lessons, although he'd rather learn MMA (mixed martial arts). The mothers brother happens to be a Russian crime lord, so when the bodies start p Jason Miller narrates this dark YA tale of a serial killer who preys on the junior class of his high school, and seems to want to frame Jason for the murders. And he thought school was bad before the killing spree started. His mother is a former Russian ballet dancer who defected to marry an American mechanic. She teaches ballet, and forces Jason to take lessons, although he'd rather learn MMA (mixed martial arts). The mothers brother happens to be a Russian crime lord, so when the bodies start piling up in the morgue, the police implicate Jason with only the slightest of circumstantial evidence. The only good to come of this? His parents finally agree to let him start training in order to be able to defend himself, since the killer is obviously obsessed with him for some reason. At times you just want to throttle the narrator yourself, as he's full of enough teen angst to sink a battleship, and also tends to sound on the whiny side. But the story moves along and keeps you wondering who will be next on the killer's gruesome craft project list... and why. There's a smidgen of romance tossed in but don't look for any HEA for Jason. Dancing with a Dead Horse by Danielle DeVor is a superior serial killer thriller for teenagers. The author expertly grips the reader with one of the most awesome opening chapters this reader has ever seen. Way to go Danielle! From there the pace is frantic as 16 year old Jason Miller discovers the mutilated corpse of a girl in the boys washroom at school. Jason's life is turned upside down and inside out as he juggles everyday teen angst with being suspected as the killer, mounting bully pressure Dancing with a Dead Horse by Danielle DeVor is a superior serial killer thriller for teenagers. The author expertly grips the reader with one of the most awesome opening chapters this reader has ever seen. Way to go Danielle! From there the pace is frantic as 16 year old Jason Miller discovers the mutilated corpse of a girl in the boys washroom at school. Jason's life is turned upside down and inside out as he juggles everyday teen angst with being suspected as the killer, mounting bully pressure at school, a distraught Russian ballet mother (wonderful character) learning MMA (Mixed Martial Arts fighting) and discovering he has a girlfriend. As the bodies mount up, Jason must stop the killer as it becomes obvious he is the target. The author never lets up on the fast pace and her first person perspective is brilliantly achieved with sharp dialog and sharper teen thought processes. If you love teen mysteries, serial killer thrillers then you will love this book. Danielle DeVor’s ‘Dancing With A Dead Horse’ is one of the best whodunnits I’ve read in a long time. This is one of those rare books that after you get a few pages into it you say: Oh man, this is gonna be really good, then shove everything else aside and dive in head first. I did and I wasn’t disappointed. Quite the opposite. I can only assume that Ms. DeVor stopped developing at the age of 16 or 17. That would explain her uncanny ability to get into the head of a teen so convincingly and see th Danielle DeVor’s ‘Dancing With A Dead Horse’ is one of the best whodunnits I’ve read in a long time. This is one of those rare books that after you get a few pages into it you say: Oh man, this is gonna be really good, then shove everything else aside and dive in head first. I did and I wasn’t disappointed. Quite the opposite. I can only assume that Ms. DeVor stopped developing at the age of 16 or 17. That would explain her uncanny ability to get into the head of a teen so convincingly and see the world through his eyes. And when that teen, Jason, finds himself accused of killing a classmate, he becomes the wrongfully accused man hounded by the sheriff and ostracized by his peers. The tension mounts at warp speed and you wonder how Jason’s going to get himself out of this mess. And then another body is found, and another, each one making Jason appear a little more guilty. At each crime scene, the killer leaves behind a gruesome signature, from which the title is derived. Although the story is not written in first person, you almost feel as if it is. Jason’s reactions to the nightmare he has been thrust into is expressed in a sort of stream of conscious narrative. He is so real, so vivid, his dialogue so believable, his teen emotions right on the surface where they belong, that you feel like he has just burst into the room and screamed for your attention the way any genuine teen would. DeVor’s ability to portray teen angst with such accuracy, compassion, and even humor is, I believe, unparallelled. She understands that a large part of that angst derives from floundering in the thorny nether land between childhood and adulthood where being accepted for who you are becomes an unending quest, especially difficult when the teen himself doesn’t yet know who he is. DeVor emphasizes this by making Jason’s mother a Russian emigrant (defector actually) who grew up in the bad old days of the USSR and remembers what it was like to be unjustly persecuted. Even though she is now a US citizen, she is still not accepted for who she is. That she is a ballet teacher who speaks broken English and forces Jason to take ballet lessons – definitely not cool – only further sets him apart from his classmates. The author grips the reader so very well. Revealing teenage life with compassion, great humor and fun. My son loved the book and was fascinated by this exciting suspense book with action packed adventure. Well written and recommended were his comments. Look forward to more of the author;s great books. Synopsis: sixteen-year-old Jason is a normal teenager. Then he finds the body of his school's most popular girl. He's accused and the count rises. Small town America gets handed a mirror and a chance to have a good long hard look at itself in Danielle Devor’s crime teen thriller Dancing with a Dead Horse. Teenager Jason Miller gets blamed for the murder of a fellow student when he discovers a body in the toilets at his high school. Things then turn sinister when he finds a doll horse made from the victim’s skin and hair in his locker. From there the story focuses on Jason’s attempts to carry on with life as normally as possible while his Small town America gets handed a mirror and a chance to have a good long hard look at itself in Danielle Devor’s crime teen thriller Dancing with a Dead Horse. From there the story focuses on Jason’s attempts to carry on with life as normally as possible while his family try to clear his name. Yet more students start to end up dead; those he knows well and classmates he has only ever spoken to a handful of times. Fear begins to set into the small town before eventually giving away to hysteria. 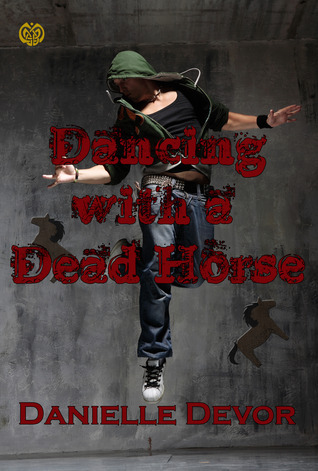 Dancing with a Dead Horse is a slow story that gradually builds to a thrilling climax. I do not usually go for slow burners but the pacing of the story is brilliant, giving enough to the reader to keep them interested while not showing too much of its hand in one go. On a wider social level the story draws attention to the darker side of small town life. Small towns and villages where everyone knows their neighbour can be great places to live. There tends to be a community spirit that cities lack. On the flip side, however, rumours, finger-pointing and paranoia run rife when something out of the ordinary happens in many such places. The theme is well explored and leaves an impression. Danielle DeVor has written a spine-chilling story about a serial killer who stalks the corridors of a small town high school. When sixteen year old, Jason, discovers the mutilated body of a mate in the school washrooms, his world, and that of his parents, is turned upside down. At first accused of committing the murder by the local police; the students and the villagers then ostracize him. The students who don���t shun him become potential victims. The killer sews a piece of the victim���s skin Danielle DeVor has written a spine-chilling story about a serial killer who stalks the corridors of a small town high school. When sixteen year old, Jason, discovers the mutilated body of a mate in the school washrooms, his world, and that of his parents, is turned upside down. At first accused of committing the murder by the local police; the students and the villagers then ostracize him. The students who don���t shun him become potential victims. The killer sews a piece of the victim���s skin onto a stuffed toy horse after each murder. The characters are well-fleshed and believable: the over-protective mother, an expat Russian who teaches ballet in the small community, and whose dream is to mould her son Jason into a great ballet dancer; the cool biker father who acts as a buffer between the pushy mother and his son���s wish to become a professional fighter. Dancing with a Dead Horse kept me turning the pages. A great YA horror mystery, but I'd recommend it for the older of the teens out there. DeVor isn't one to shy away from the horror or the violence. I really enjoyed the main character's point of view, his language, and his attitude. The voice of the story as much as the tension and the suspense kept my attention. It was interesting to see his view of himself mirrored with the other students' view of him. The small town, the police force, his par Dancing with a Dead Horse kept me turning the pages. A great YA horror mystery, but I'd recommend it for the older of the teens out there. DeVor isn't one to shy away from the horror or the violence. I really enjoyed the main character's point of view, his language, and his attitude. The voice of the story as much as the tension and the suspense kept my attention. It was interesting to see his view of himself mirrored with the other students' view of him. The small town, the police force, his parents' relationship, as well as his mother's family background all played a piece of the well developed setting and story of the novel. What the hell? Why would people rate it so high? She has family and friends writing reviews for her or what? The first few chapters were good. Then, it flopped. It when from 'hey this could be fun' to 'I've wasted money' and at the end 'you got to be kidding me'. The author should read her book again and tell people it's worth reading or otherwise. Don't normally write review's but had to on this one. The high ratings drew me to the book and I just don't get it. The book draws you in at the beginning then falls flat quickly. The build up leads to an ending that feels rushed and not worth the wait. Terrible. Poorly written. No depth. the book was poorly written and had a sense of not being edited. the story line was hard to follow and felt disjointed. The mystery was solid but the first person narration was a tad annoying. I'm just not that sure how this got such good reviews. Boring, unnecessary fillers, no memorable characters, choppy, and poorly written.